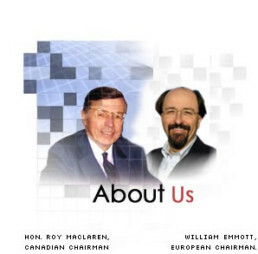 On June 16, 1999 came the official entry of a new heavyweight in transatlantic business – the Canada-Europe Roundtable for Business (CERT). CERT was officially launched by Canadian Ambassador to the EU, Jean Pierre Juneau, in the presence of International Trade Minister Sergio Marchi, EU Vice President Sir Leon Brittan and a distinguished crowd of business representatives from both sides of the Atlantic. Baron Paul de Keersmaeker, Chairman of Interbrew and CERT, outlined that the programme represents an important new channel for Canada-EU cooperation on bilateral and multilateral trade and investment issues. Marchi and Brittan applauded the initiative of the business representatives in attendance and welcomed the presentation of CERT’s first policy paper. Detailed recommendations from CERT’s working groups on trade issues, and on biotechnology, agri-food and intellectual property outlined in the policy paper were presented. Minister Marchi suggested that CERT could act as an early warning system, advising governments of upcoming trade irritants so that trade conflicts could be avoided. Sir Leon Brittan vowed that the EU and Canada will “listen hard and take very seriously what you have to say”. At the Canada-EU Summit the following day in Bonn, Canadian Prime Minister Jean Chrétien, German Chancellor Gerhard Schroeder and European Commission President Jacques Santer expressed their strong support for CERT.